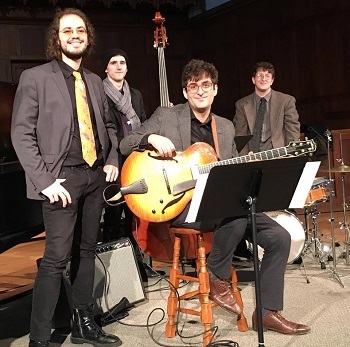 Award-winning jazz pianist, composer, and accordionist Ben Rosenblum has been described as “mature beyond his years,” (Jon Neudorf, Sea of Tranquility), and as an “impressive talent” (C. Michael Bailey, All About Jazz), who “caresses [the music] with the reverence it merits” (Bob Doerschuk, Downbeat Magazine). Based primarily in New York City, his original music combines an extensive knowledge of the history of jazz with a free-wheeling, modern melodic sensibility and powerful narrative approach to the piano. His profound passion for jazz, swing, and world music genres finds expression in his unique fusion of harmonic and rhythmic elements from a wide array of sources. Ben's first priority in his composition and in his playing is always narrative – to tell a compelling story with his music, while reaching the hearts of his audience, connecting on an emotional, an intellectual, and a spiritual level.